Clive and Trina Gare are cattle graziers from South Australia’s Mid-North with their home property situated between Hallett and Jamestown. 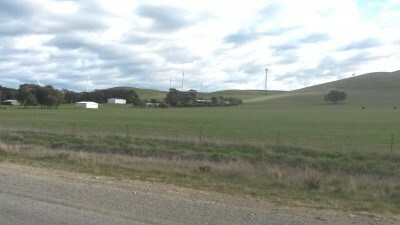 Since October 2010, the Gares have played host to 19, 2.1MW Suzlon s88 turbines, which sit on a range of hills to the West of their stately homestead. Under their contract with AGL they receive around $200,000 a year; and have pocketed over $1 million since the deal began. In a truly noble and remarkable move, the Gares gave evidence to the Senate Inquiry into the great wind power fraud during its Adelaide hearing, last week. Here’s their tragic story. Mr Gare: Thank you for inviting me to present my submission today. My submission deals with the impact on my health and lifestyle living in close proximity to a wind farm. Let me say from the outset that we were excited about the prospect of being part of the renewable electricity industry. I am a host to wind towers on my property, the nearest being about 800 metres away with three towers within approximately one to 1.5 kilometres away. We were not made aware of the impacts of noise on our health or lifestyle. Fortunately, we had heard from others that they were quite noisy. Luckily, in our contracts we inserted clauses about the need for noise mitigation. If the wind tower operators were confident of their impact studies, that clause would not be necessary.